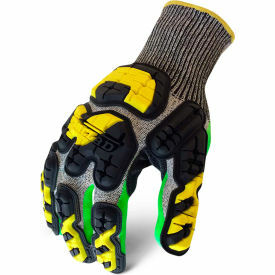 The Industrial Impact Knit Cut 5 Grip features CE EN388 cut level 5/ANSI A3 cut resistant palm. The Foamed-Nitrile palm is high viz and padded for impact absorption. It’s lightweight, breathable, and offers full back of hand protection on the fingers, knuckles and metacarpal bones.